All lottery players, whether playing alone or as part of a syndicate, dream of winning big. When lottery players read of big wins, they imagine what it would be like if they get a chance at the big money. What gets lost in all the excitement is the real role of money in the grand scheme of things. A lot of us, if asked, would say our goal is to win a huge amount of money. But in reality winning a lottery jackpot, no matter how huge the amount may be, is just the first phase. Money is just an enabler; it gives us the ability to do whatever we want to do, and the way we want to do it. Past lottery winners have had different reactions to big wins. Some of them exhibited disbelief, as if they never really expected to win. Others give the “I knew it” reaction. And the directions they have taken also differ widely. Some retire immediately, others pursue a life of philanthropy, and others invest in business ventures. Only one thing is common with big lottery winners, at least just after they have won; they were in a position to do whatever it is they want to. For lottery winner Ivan Westbury of Mapperly Plains, that is not retirement. Ivan and his wife Susan both lived in Mapperly where their family expanded to include three grown-up children and seven grandchildren. They have never been well off and before their win they had even booked a vacation trip that cost a mere £9.50 through an offer in the Sun. You can say that they were used to watching pennies and living a simple life. Mr. Westbury has always been a working man. He was a partner in a company which installed lightning protectors in the surrounding community. The company had about 25 employees and was having a hard time making money. It got so bad in 2010 that Mr. Westbury jokingly told his account manager that they needed to win the lottery to save the company. And that is what happened shortly after. The couple played the lottery, perhaps like us, dreaming of landing a big prize that would rescue them from dire financial straits. They were not disappointed. The win came through one lucky-dip ticket his wife Susan bought, and it was she who found out they were winners. She had a clerk at Tesco’s scan her tickets only to be shown a slip of paper advising her to contact Camelot. The clerk explained that must mean they have won something big. Despite the long queue behind her, she was unable to move for some time. The clerk then helped her contact her husband. They later learned their won a roll-over jackpot of £7.7 million. They thought of immediately celebrating at a local pub, but then realized they didn’t have any money on them – yet. 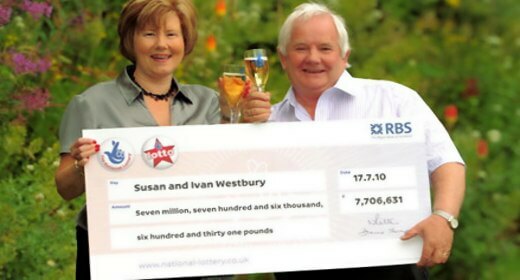 With that amount of money it is easy to lose one’s bearings, but not the Westbury couple. They have taken care of family and have even given some to charity. They bought an eight-bedroom house, but later decided to downsize to a four-bedroom house. But one of the first things that Mr. Westbury did was invest £800,000 in their lightning protection business. He felt he owed it to their loyal employees to help them keep their jobs. And, truth be told, he loves the work he does. His wife Susan has been encouraging him to take a vacation for a long time; he has not taken one in the last four years. So he decided to give retirement a try. He found it did not suit him very well. By afternoon he was tired and yet he had not done anything. So he went right back to work. He still wants to see if he can bear having one day off per week, and then perhaps progress from there – after all, it’s not as if he cannot afford to. The win did not change them very much. The only thing that changed is financial security, for they still watch the pennies even if they don’t have to. What is important is that they can now do whatever they want to; and for Westbury, that includes working in a lightning protection company! As lotto players we’re all in love with hope, and as long as our faith in hope prevails, there will always be winners!